When enabling Easyship for your online store you are establishing a relationship directly with them and are subject to their terms & conditions. All shipping fees & charges quoted are generated by Easyship and are payable directly to them. Any transactional and operational queries that happens on the Easyship platform should be referred to Easyship directly. Any queries about Easyship on the Shopmatic platform, will be resolved by your dedicated Ecommerce Consultant. 1. I’m a new Easyship user, how do I enable Easyship? A. If you are a new customer on Shopmatic and a new Easyship user then all you have to do is click “Enable”, and your Easyship account is created. 2. I’m an existing Easyship user, how do I enable Easyship? 3. How do I access my Easyship account? A. After the Easyship account creation on Shopmatic, you will receive an onboarding email from Easyship. Reset the password on your Easyship account as instructed and you are ready to start. 4. I do not want to use Easyship anymore, how do I disable my account? A. Just click Disable Easyship in the Shipping module on your Shopmatic dashboard. 5. I want to use another Easyship account, can I do so? A. Yes. First click “Disable” Easyship which disconnects your current Easyship account. Then click “Enable” again and you will be able to link to a different easyship account, provided you have the API and Secret Key. 6. How do i change my email notification address for Easyship? A. Log in to your Easyship account and edit your email settings on the Profile page. 1. What are the product categories for Easyship? 2. Why is it important to indicate the right product category for my store set up or when I list a product? A. This information will be used to filter courier services, accurately calculate shipping fees and apply tax and duty estimates when products are purchased on your store. This will help you give the best shopping experience for your buyers as well as reduce chances of errors with Easyship at the time of pick up. 3. At the store level, which product type should I choose if I’m selling general merchandise or many different types of merchandise? A. Choose the merchandise that best represents your store overall. 4. At the product level, how do I set the product type for each item? A. When you are adding a Product on Shopmatic, go to More Settings and update the Product Type. This will override the platform level product type and enable accurate shipping fee calculations specific to this product. 5. How can I correctly measure the package dimension? A. You should measure and indicate the expected package size and not the actual product size. It is advisable to keep in mind the potential packaging material that will be used to wrap/protect the product being shipped to determine the correct package size. 6. Are there any standard package/box sizes that I have to follow to indicate the product dimension, at the time of product listing? A. Some couriers may follow specific package/box sizes for shipping and change their policies occasionally. Please refer to support at Easyship to get the most updated information. 7. What happens if, at the time of pick up, the shipping company feels that the actual package size is bigger than the package dimension I have specified in my store – will I be charged a top up fee? A. If there is a difference in the package dimension stated in your product listing and the actual package dimension being shipped, the courier company may revise their shipping charges to you. It will be reconciled in your Easyship account at the end of each month. Any disputes arising on this issue will have to be directed to Easyship for resolution. Repeated offenses of this nature may lead Easyship to blacklist the merchant account with them. 1. I want to use Easyship for international orders, how do I enable it? A. Easyship is an international shipping solution offering multiple courier options. When you enable Easyship you can automatically avail international shipping at any time. 2. For international shipping, who pays the taxes and duties? A. Automatically, new Easyship accounts created on Shopmatic will be set as Duty Delivered Unpaid (DDU), ie the buyer of the product will pay the international duty and customs. As a merchant, if you wish to absorb these charges on your products, you can update to Duty Delivered Paid (DDP) on your Easyship account. 3. Can I choose which courier options are available to my customers? 4. I want to use different companies for Domestic vs. International Shipping, how do I set this up? A. No, it is not possible to choose separate courier partners for domestic versus international shipping via Easyship. If you wish to do so, simply Disable Easyship from your account and choose self-managed shipping. 5. I want to offer free shipping for orders above a certain amount, how do I set this up? A. To offer free shipping, you can set the rules in the Shipping module. With Easyship enabled, the value of the cheapest shipping rate will be made free to your customers. Further, that amount will be deducted from the Best value rate and Fastest shipping rate quoted to your customer so they continue to see the benefit from your offer. 1. I received an order, how do I arrange for Shipping? A. 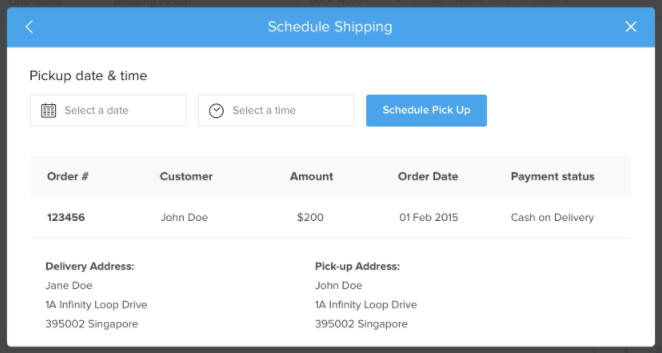 Manage the shipping process in the orders module. Start by selecting the “Actions” button, and click on “Schedule Shipping”. 2. How do I print the Shipping Label? A. 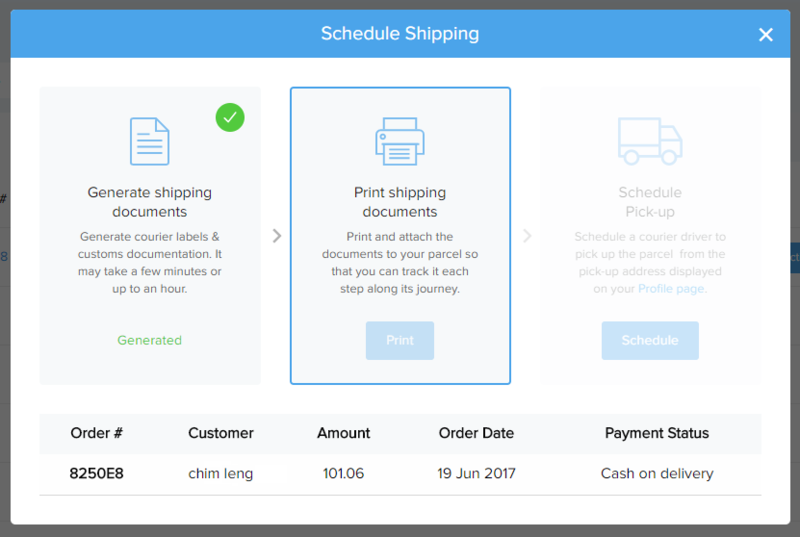 After selecting “Schedule Shipping”, confirm the shipping carrier and rate chosen by your customer. This will bring you to the next step where you to generate the shipping documents. It might take a few minutes for the shipping documents to be ready. 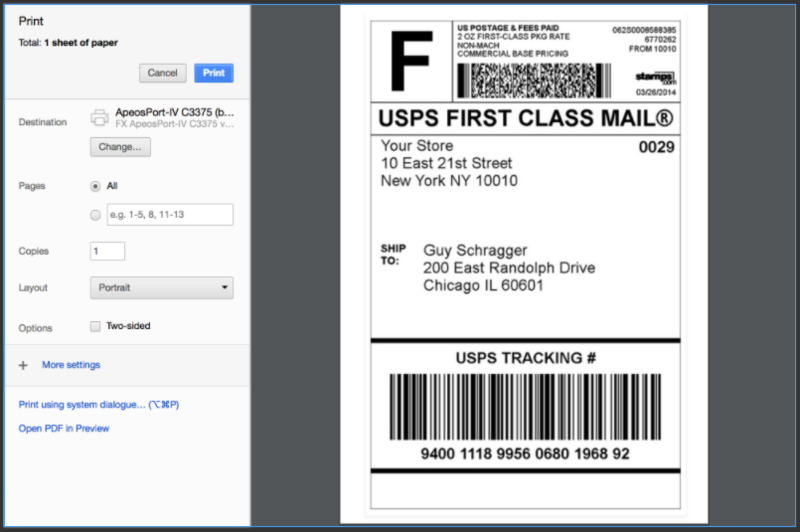 Once it is ready, print the necessary Shipping Documents and attach it to the parcel. 3. How do I get a tracking ID for a shipped package? A. The tracking ID will be automatically sent from Easyship to you and your buyer via email. You can also access it on the Shopmatic orders page, under Shipping Label. You can also log in to Easyship, and see it in the shipping summary. 4. How do I schedule a pickup? A. After printing the shipping labels, you can schedule a date and time for the package to be collected from the pick-up address stated in your account. 5 How do I change my pickup schedule? A. Contact Easyship or the courier directly to make changes to the pick-up schedule. 6. How do I cancel a pickup? 7. How does the courier company collect or pick-up my items? A. The courier company will pick-up the package from the Shipping address registered in your Easyship account. 8. How do I change the pickup address? 9. Can I arrange a drop-off to the courier collection center instead of a pick-up for my items? A. Yes, you can. By default, Easyship activates only courier pick up solutions when you create a new account. However, you can add drop off solutions – simply login to your Easyship account and including Drop off solutions. 10. Will my buyer be able to track the status of their order at my store? A. Yes, your buyer is kept aware of the status of their order throughout the shipping process. When you schedule a pick-up of their package an email will be sent to the buyer with the tracking code. 11. How do I change the delivery address? 12. How do I notify my buyer about shipment changes? A. Any changes on the shipping will have to be notified directly by you to your buyer. 13. How do I make a refund to my buyer? A. Make a refund to your customer from the Shopmatic Orders dashboard for their payment to you. Then claim a shipping refund from the Easyship dashboard for the canceled order. 14. How long does it take for my refund to be credited back to my Easyship account? A. It takes about 14 days for the refund to be credited back to your Easyship account. 15. My buyer will be paying offline for their order, how do I arrange a delivery? A. You can arrange for shipping for any order routed through your online store, regardless of its status of payment collection. Simply start the shipping process by selecting Schedule Pick up. 1. I want to change my Business Address. How do I change it? A. Simply update your Business Address on the Shopmatic platform at My Profile and the Easyship settings page. 2. How do I top up my Easyship credits? 3. Where can I find the shipping requirements for international shipping? 5. Who can I approach to help resolve this disputes? 6. Does Easyship provide Cash on Delivery service? A. This service is currently not available. All such orders have to be self-managed by the store owner. 7. Does Easyship provide packing services? A. This service is currently not available with Easyship. All packaging has to be self-managed by the store owner. 8. Does Easyship provide warehousing solutions? A. This service is currently not available with Easyship. 9. My business is in F&B, can I use Easyship to deliver my goods? 10. What courier companies are available on Easyship? A. Easyship has over 80+ courier service providers. For customers that choose Singapore whilst creating a Shopmatic account, please click here. For customers that choose Hong Kong whilst creating a Shopmatic account, please click here. 11. Can I organize a return pick up of a package from my buyer using the couriers on the Easyship panel? A. This service is not offered via the Easyship platform. Return pick-ups will have to be co-ordinated between you and the buyer independently.